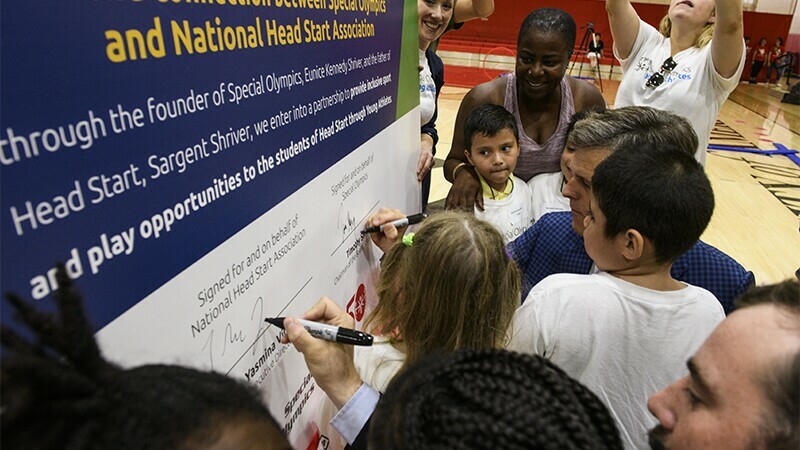 Dr. Timothy P. Shriver, Chairman of Special Olympics, and Thomas J. Sheridan, Senior Director of Government Affairs of the National Head Start Association sign the large Memorandum of Understanding along with numerous young athletes. On 6 September, Special Olympics partnered with the National Head Start Association (NHSA) by signing a Memorandum of Understanding (MOU) to support the growth and expansion of Special Olympics Young Athletes. The signing occurred at a Young Athletes Festival hosted by Special Olympics DC, which included over 350 children and 300 volunteers. “For more than 50 years, Head Start and Special Olympics have had the same belief: that every child has a gift and every child deserves the opportunity to share it,” Dr. Timothy Shriver, the Chairman of Special Olympics International, said during the signing. In addition to Dr. Shriver, Thomas Sheridan, Senior Director of Government Affairs for NHSA and Nicole Preston, President & CEO of Special Olympics DC spoke to commemorate the event. Novie Craven, a Special Olympics DC athlete and a Special Olympics USA Games gold medalist also attended. A young athlete participates in one of the indoor stations during the Young Athletes Festival. After the traditional MOU was signed, the children had the opportunity to a sign a 4 by 6 feet MOU as well. After the signing concluded, there was a dance party and then the Young Athletes festival recommenced. Since their inceptions, Special Olympics and Head Start have been connected. Head Start—a United States Department of Health and Human Services program that provides comprehensive early childhood education, health, nutrition, and parent involvement services to low-income children and their families—was created in 1964 under the leadership and vision of Sargent Shriver, former President and Chairman of the Board Emeritus of Special Olympics. NHSA was created just a few years later, and today is the voice for more than a million children, 200,000 staff, and 1,600 Head Start grantees in the United States. NHSA is a nonprofit organization committed to the belief that every child, regardless of circumstances at birth, has the ability to succeed in life. Head Start centers around the United States provide children from low-income families, including children with intellectual disabilities, with access to early intervention and preschool programs. 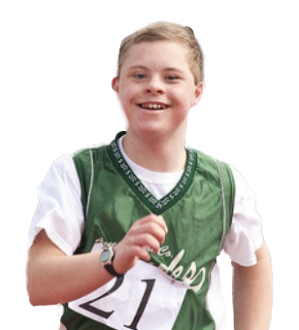 Similarly, Special Olympics Young Athletes supports children with and without intellectual disabilities, ages 2 to 7 years old, around the world in schools, communities, and at home and introduces basic sport skills, like running, kicking, and throwing. The new partnership will open doors to expand Young Athletes to reach an even more vulnerable population of children with and without intellectual disabilities. It will help provide Special Olympics Programs with the tools and resources to successfully implement Special Olympics programming within the Head Start model and structure. Young Athletes can be the starting point for children in Head Start to connect with a community they can be part of for a lifetime. 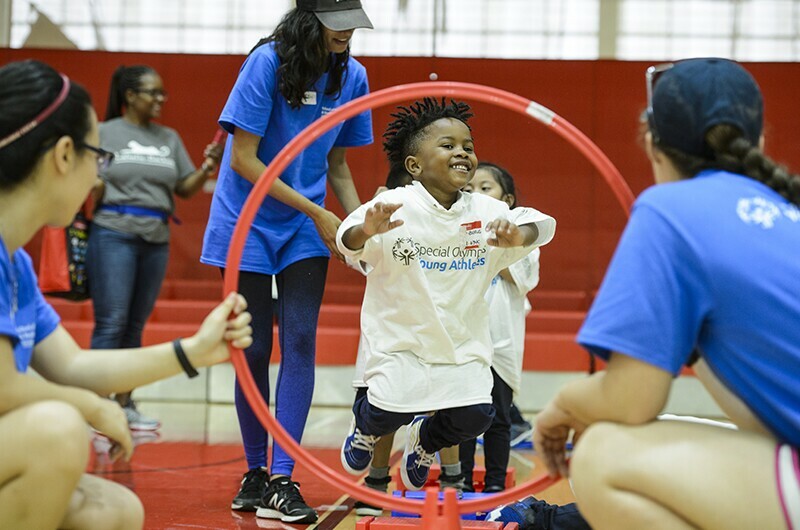 The first year of the partnership will include piloting activities in seven Special Olympics Programs for the 2018-2019 school year, including Arizona, District of Columbia, Georgia, Minnesota, Nevada, New Jersey, and Southern California. The Special Olympics state Programs will work directly with Head Start sites to implement Young Athletes during their school day. After the successful roll out of the Year 1 pilots, Special Olympics International and Special Olympics North America will work with Programs to institute the partnership nationwide. 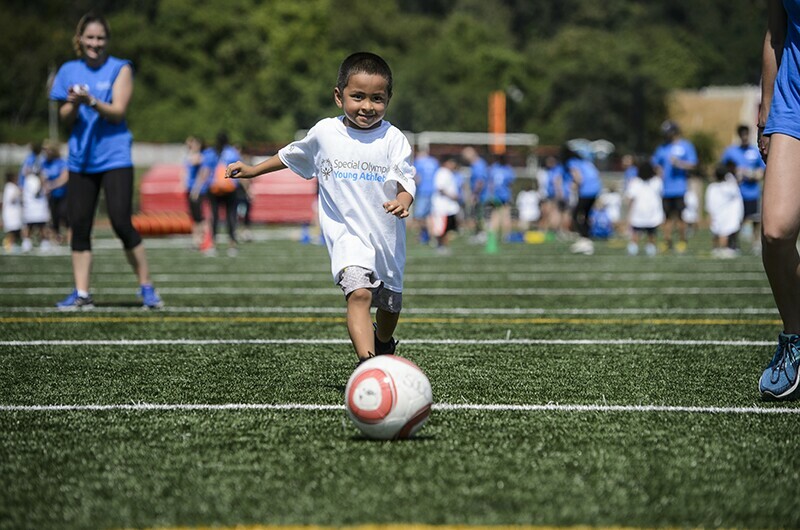 A young athlete prepares to kick a soccer ball during the outside portion of the Young Athletes festival.